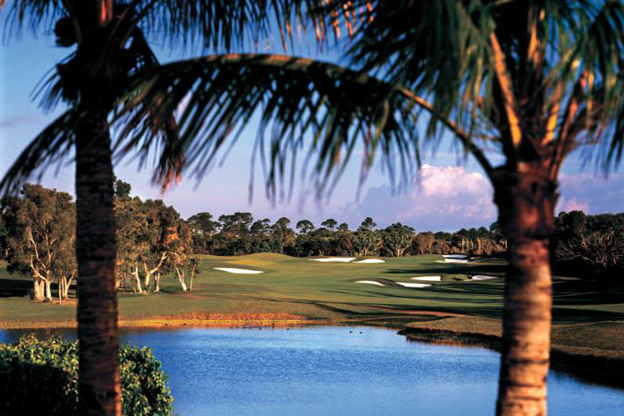 Every golfer dreams of playing in the perfect setting. 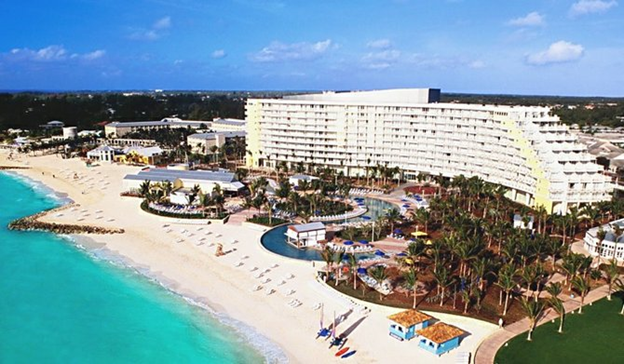 The beautiful backdrop of Grand Bahama Island makes Grand Lucayan one of the most spectacular places to tee off in the world. This is as near as you'll ever get to a golfer's paradise so it's no surprise that 'The Golfer' magazine rated our resort one of the top 100 around the globe. The open, breezy Reef course has 6,930 yards of expansive greens and fairways, scattered with bunkers, water hazards and grassy rough. This links-style course stretches almost 7,000 yards from the back trees and only requires a solid, short game to achieve a low score. The close-cropped fairways are forgiving, but the bunkers will test you. 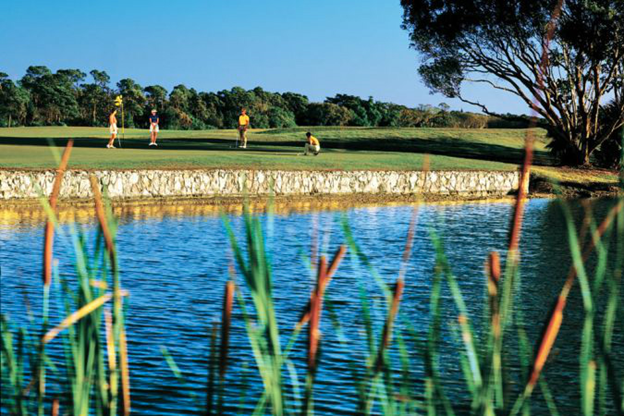 The greens are large and mostly flat, with a deceptive speed and 13 of the 18 holes play off water. Putting green and chipping green. Robert Trent Jones Jr is widely recognized as the leading golf course architect of the post-World War II era. 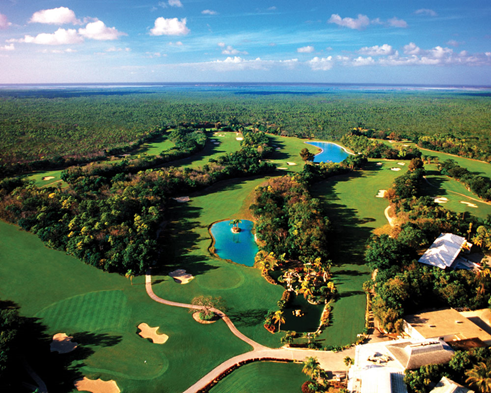 At Grand Lucayan we offer you an opportunity to experience the legacy of great golfing icons on our championship course. The Reef course, designed by Robert Trent Jones Jr in 2000, embodies the trademark design flair and challenging inventiveness of his celebrated creators. In a career spanning more than four decades, Robert Trent Jones Jr has designed more than 270 golf courses in over 40 countries across six continents. RTJ II courses have won countless awards and accolades, been ranked among the best layouts in the world and hosted tournaments on every major golf tour. Like Rolex watches or Faberge jewelry, the Trent Jones name is a trademark of exceptional quality that guarantees a well-crafted golf venue, set comfortably in its natural environment. Jones is a member of the California Golf Hall of Fame, a long-standing member, former president and current board member of the American Society of Golf Course Architects, and the recipient of many other industry awards and honors. No matter how often you travel, there's always a moment of eager anticipation when you slip that key in your guest room door. 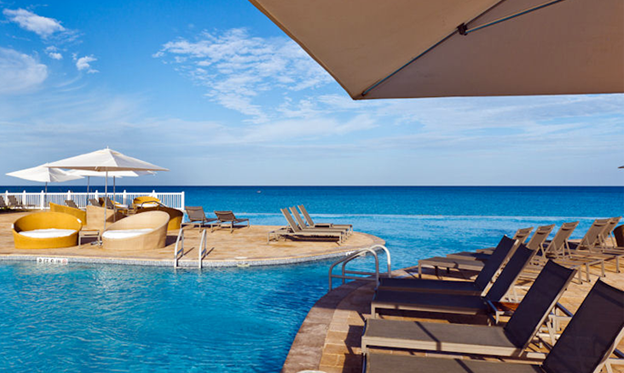 At Grand Lucayan, that moment is followed by the happy discovery that your room is really an island-inspired retreat. Light-as-air colors and crisp white bedding create a setting of Caribbean-splashed comfort. From balconies overlooking the blue-hued beauty of the ocean to furnishings that reflect our low-key, tropical vibe, everything about your guest room tells you we've mastered the art of authentic Bahamian style. And though you may be tempted by the oversized plasma television and complimentary WiFi, just slide open your balcony door and let the sea breeze work its magic. These rooms have stylish, Caribbean-inspired decor, 400 square feet of floor space and either a balcony or patio. These rooms have stylish, Carese rooms have stylish, Caribbean-inspired decor, 400 square feet of floor space and either a balcony or patio. Our ocean-view. 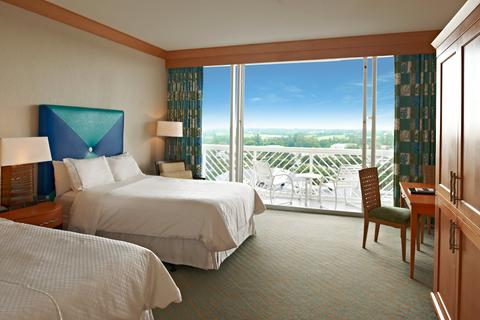 one-bedroom suites have stylish, Caribbean-inspired decor, 800 square feet of floor space and a double balcony. Our ocean-front one-bedroom suites have stylish, Caribbean-inspired decor, 900 square feet of floor space and a double balcony. 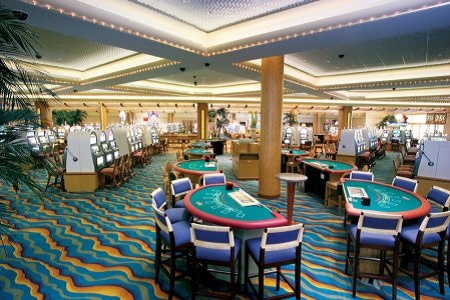 Located just a few steps from the resort, the Treasure Bay Casino is a thrilling Vegas-style adult playground with tables, slot machines and tournaments. There's plenty of action 24 hours a day in over 35,000 square feet of playing space, including 400 slot machines and 30 gaming tables for craps, blackjack, roulette, three-card stud poker and mini-baccarat. The Player's Club offers cash, hotel and meal incentives, with exclusive member-only discounts and invitations to casino special events. For entertainment there's Club Cove, a cabaret lounge that's fast become one of the hottest nightspots on the island, with dancing, theme events and a Thursday dinner show. Paris may have the world's greatest works of art, but Grand Bahama most certainly has the world's finest collection of beaches. Take a sunrise walk down our own private Lucaya Beach. Visit Fortune Beach, where treasure hunters recently found a $2 million dollar shipwreck. Escape to complete isolated privacy in Paradise Cove at Deadman's Reef. Swing by Xanadu beach for an icy local Kalik beer and some spicy local BBQ... Or, explore Gold Rock Beach at Lucayan National Park, which is known to many connoisseurs to be the most spectacular beach of all. 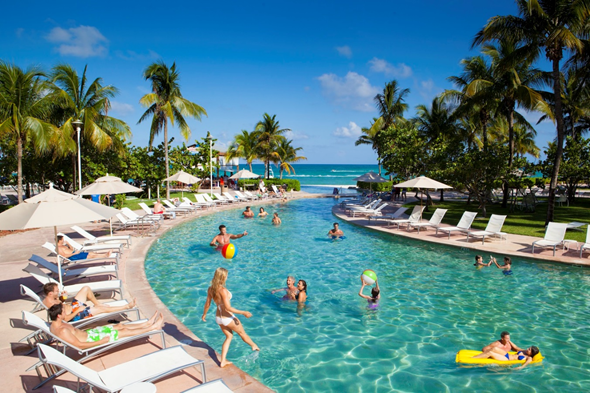 When you're smack dab in the middle of a Caribbean aquatic wonderland, its easy to become a bit amphibious here. Go for a lazy afternoon swim (think 80º water temps), kayak through the mangroves of Gold Rock Beach or dive for lost Spanish treasure at Deadman's Reef. Feeling a bit more adventurous? 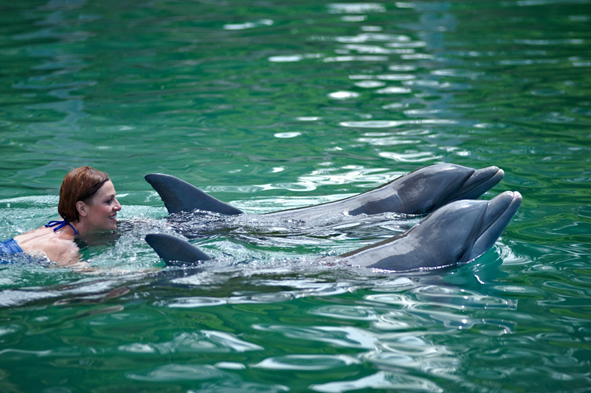 Join the local Underwater Explorer Society and frolic with wild Dolphins at an offshore reef. Need more thrills? Grab your courage and sign up for one of the island's legendary shark-feeding tours. You'll come home with photos and stories to last a lifetime! 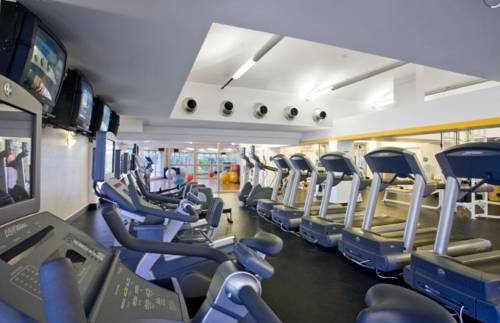 Senses Spa & Fitness Center is a luxurious retreat designed to soothe your body, renew vitality and indulge the senses. Covering 25,000 square feet, this superb ocean-front facility offers an extensive selection of relaxing and invigorating treatments and therapies. Prepare to indulge. At Grand Lucayan, seven restaurants cater to your every culinary whim. From classic Bahamian fare like conch fritters, benny cake and guava duff to an array of international cuisine that melds flavors from the Mediterranean to the Pacific Rim, our dedication to quality and originality shines through in every dish. Our fresh-caught seafood is prepared so imaginatively that even the locals stop by to savor it. From homemade pasta at Churchill's and exotic Hong Kong roast duck at China Beach to Willy Broadleaf's true culinary melting pot, dining is one of the things we do best. And, of course, no trip to Grand Bahama Island is complete without a Goombay Punch at our festive Bahamian Buffet and Fish Fry. When fine dining is your focus, head to Churchill's for cuisine that taps the flavors of the Mediterranean. If the Pacific Rim is your passion, China Beach is the dining destination for you. Our best advice? Try them both! 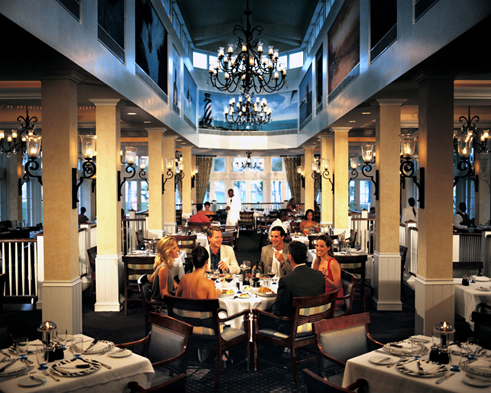 Merging the culinary traditions of the Mediterranean with the tropical atmosphere of the Bahamas, Churchill's shines among the island's premier restaurants. This world-class fine dining venue offers an imaginative menu of homemade pastas, succulent seafood and beloved classics such as Veal Marsala and Osso Bucco. Our menu showcases the finest and freshest ingredients available. Hours & days of operation vary. Please contact the resort for more information. Our chic China Beach restaurant offers a culinary tour of the Pacific Rim, with an appetizing menu inspired by the exotic flavors of Vietnam, Thailand, Korea, Indonesia and Malaysia. Specialties prepared by our talented chefs include mouth-watering sushi dishes and fresh Bahamian seafood. Imaginative and colorful Asian decor sees scarlet parasols doubling as chandeliers in a restaurant that seems to float above the resort's serpentine swimming pool. Discover international cuisine that draws inspiration from India, Mexico, Africa, the Bahamas and the USA along with some other irresistible flavors. It's all served in inspiring surroundings that could find you seated in a Mexican courtyard or an African village. Enjoy a lavish buffet breakfast, with something for every taste. Plus don't miss our Champagne Brunch on Sundays and Bahamian Night on Fridays. Open for Lunch and Dinner on select nights. 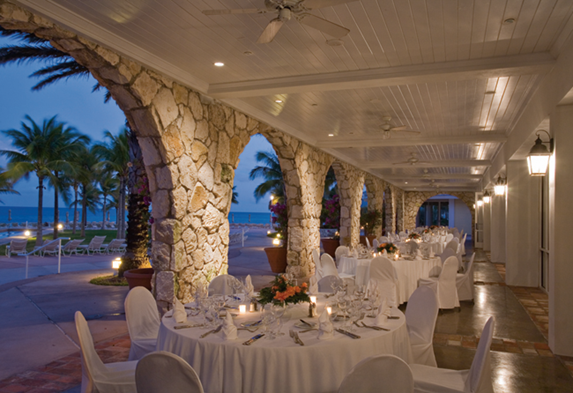 The colonial-style restaurant that lets your taste buds experience various Caribbean cuisines with Bahamian influence. The restaurant is divided into rooms honoring the colors and character of Puerto Rico, Mexico, Cuba, Jamaica, Trinidad & Tobago. Enjoy a quick snack or something more substantial at this outdoor grill. From an Asian chicken salad to a traditional hamburger or hot dog, there's sure to be something that'll hit the spot. This outlet is now cashless. You may easily sign all charges to your room. For day-pass holders, please visit the front desk or security check-point for additional information. Imagine a place where lush green lawns stretch toward powder-soft white sand. Coconut palms sway in a fragrant breeze and crystal-clear turquoise waters lap gently along the shore. There's no impatient crowds, no rush to grab beach chairs, no boring restaurants. 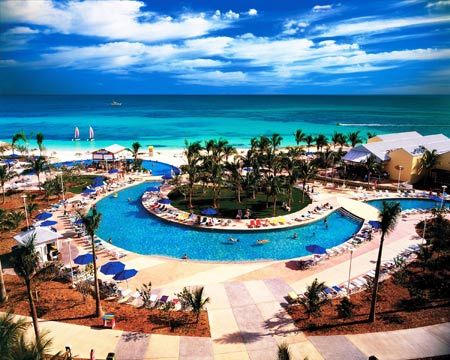 At Grand Lucayan, we work to strike the perfect balance between the luxuries of a modern-day resort and the magic of one steeped in Bahamian culture. 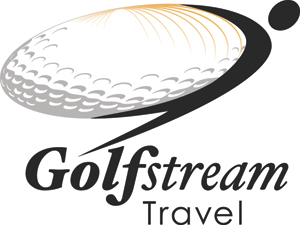 For us, it's about delivering an experience that exudes authenticity yet welcomes the creature comforts that make traveling a pleasure and a passion. This is the Bahamas at its laid-back best. It feels real because it is. 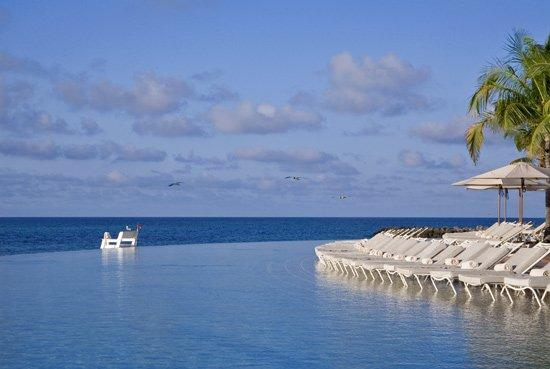 It's the Bahamas you remember, wrapped in a resort you'll never forget.